DesMan – ready to travel? 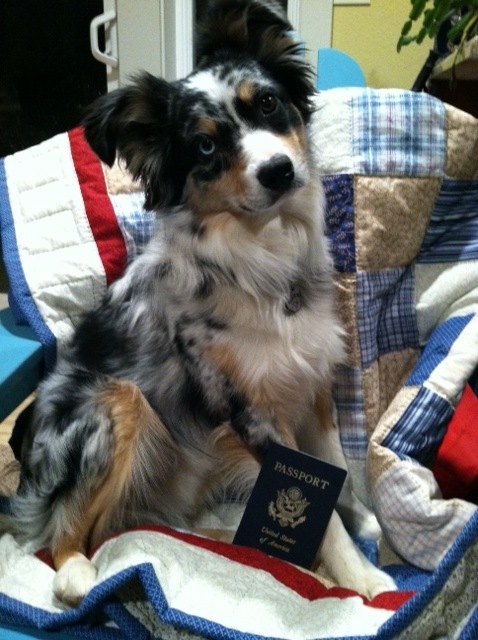 International Agility – FCI, Worlds, EO, what does it have to do with my trialling with my Merlie boys? Well, in the last year or two, quite a lot despite our feet staying firmly in our own little neck of the woods. We’ve participated in several online courses with students from all over the world, focusing on international style handling. With Duncan, I admired international handlers from afar and studied the gnarly European courses and puzzling moves. You see, Duncan has always been a teammate who ran for the love of me… (and some cookies) not especially for the love of the course. But while he can open up and fly on flowing courses, I learned to love the challenge of finding him a way through a technical course. Pinwheels were a drag, wraps were a cause to throw on the brakes and I’d earn Dunc-glares. So, I threw myself into learning how to handle efficiently, and find ways to preserve his hard-earned speed as often as possible. While I’m not always successful, when I cross the line with a grinning Dunc after a twisty course, I feel we’ve truly done something special together. Desmond, on the other hand, drug me into the international school of agility handling, and in no time at all, I was converted. Being able to train and practice with friends and teachers locally is irreplaceable, and I count many fellow competitors from the region as dear friends. But in addition, the cool part is that my agility community now also crosses the country and spans the world. Being able to bounce ideas off others also trying to push their boundaries well past what most of us see on the weekends is hugely motivating. So what about the moves and skills? After many moons of teaching Des to collect, to extend, to wrap and slice, I’d love to actually test those skills on U.S. courses. While I may harbor distant thoughts to competing internationally, that may just not be logistically possible for me…or many others like me. Until recently, it seems these super technical courses have only been seen a few times a year at WTTs or various venue regional/nationals, which is still something many teams can only manage once in a great while, if at all. 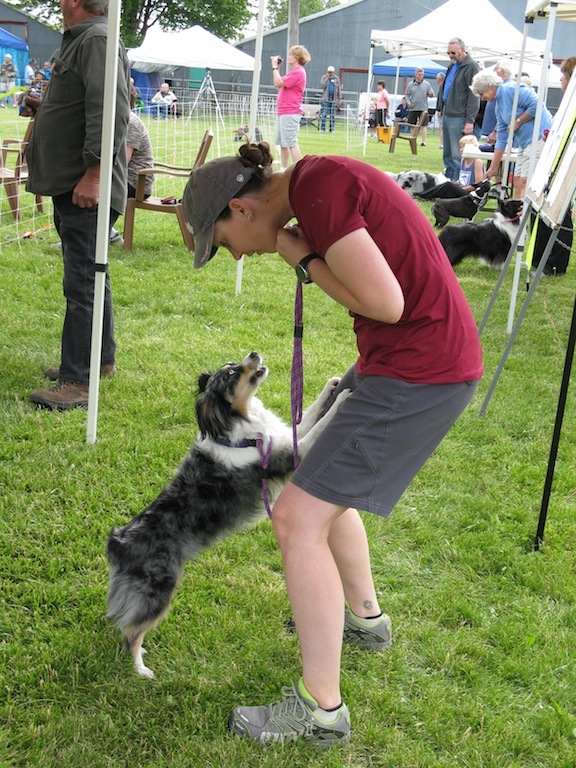 Why not offer some international-style course options like USDAA Masters Challenge or AKC’s rumored ‘Excellent C’ for everyone to run if they choose? For those who want to give it a shot, let’s push our boundaries and challenge our team skills way past our comfort zones. Surprising things can happen…eventually that might become our comfort zone. Or at least, a place that doesn’t scare the crap out of us while being scope-locked on the course map. And for those who worry that the venues will become too difficult or exclusive for the EveryDog, I don’t think that’s going to happen. I too, run an EveryDog, and I will continue to run and play with Duncan on courses that bring us joy, twisty or not. There is a place for courses that are difficult, that make you think, to puzzle and walk the path a dozen times, to employ that handling move you’ve rehearsed a thousand times in your back yard…just as there is a place for fun, but challenging courses that can be run by everyone. I get it, not everyone can run as hard and fast as they may have once done. (I now have the hardware to prove it myself) Some handlers blow my mind with their amazing connection and skills at a distance, or ability to flow like water around a course. A gray-faced teammate wagging his way around the course with his beloved handler will always bring me to tears. 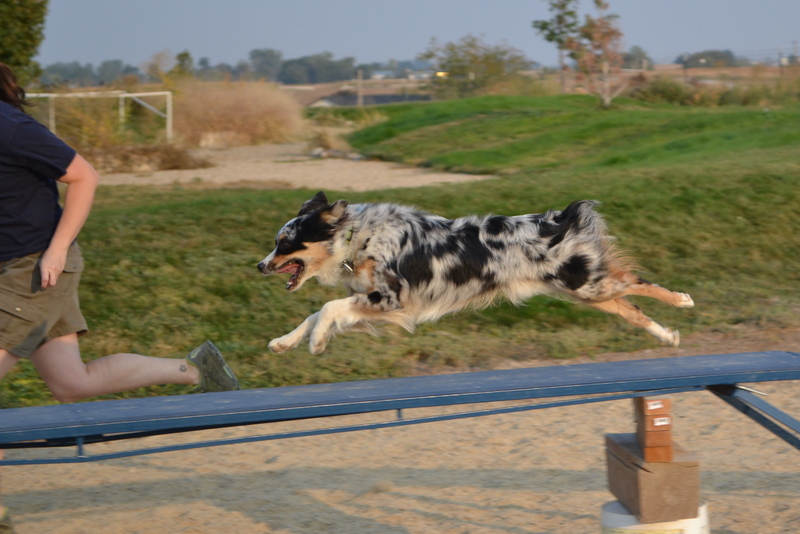 But that’s the beauty of agility; there’s something for everyone. And Des and I vote for more course options for back sides, wraps, and pull-throughs. Why? Because I like a challenge, because it’s tough and because my legs still work. And maybe…just maybe…after falling victim to our share of traps and NQs, someday we’ll get to experience rocking a monster course, look back, and spit in its eye.